You can expect quality care in a comfortable atmosphere. The first people you’ll meet are Ashley and Krista. They have been welcoming, scheduling and making new patients feel comfortable for a long time. Everybody says they’re fantastic, and they are. Several have observed that they started feeling better the moment they walked in the door. We collect only the essential information that we need to help you and explain your case to your insurance company. You can get a head start by downloading our Health History form and completing it at home. 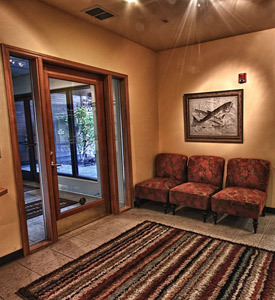 Others prefer to complete it in our reception room while sitting in our popular massage chair! Then you’ll meet Dr. Tobey for a brief, pre-care interview. He’ll ask questions and truly listen to your answers. Really listen. He wants to be sure you’re a good candidate for chiropractic care. If you are, a thorough examination will be conducted. Some say it’s the most complete examination they’ve ever had. Dr. Tobey will test the strength of certain muscles and see how you turn and bend. You won’t be gowned. Just wear comfortable street clothes. If pictures of your spine are needed, state-of-the-art digital X-rays are on the premises. 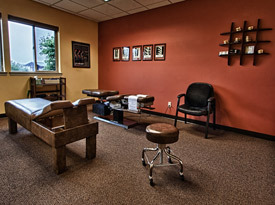 Our adjustment room where you will receive care. With a clear understanding of your problem, Dr. Tobey will deliver your first chiropractic adjustment. Expect some homework! Perhaps it will be instructions on how to use ice, how to use spinal supports, the importance of drinking more water or urging you to do some walking. Chiropractic is a partnership approach to better health. Plan on another visit within the next 48 hours, although it’s not always necessary. Often Dr. Tobey will use your next visit to teach you how you can participate in your own spinal hygiene with a custom exercise program he has developed from your previous visit. Dr. Tobey is never too busy to find out what’s going on with your life. “How are you feeling?” “How you are doing?” “How are the kids?” Since your health affects everyone you know and everything you do, his curiosity is part of charting your progress. Motion palpation is doctor speak for feeling bones and muscles as they move through a normal range of motion. This identifies tender areas and joints that aren’t moving right. After monitoring how your body used the energy from the last adjustment, Dr. Tobey knows exactly where your spine needs to be adjusted. During the first couple of weeks, Dr. Tobey will be doing most of the work. As your spine strengthens and your health returns, expect to play a more active role in your recovery. This often involves an exercise designed specifically for you from your posture screening. Call our Bend chiropractic office today!